Late Bloomer. Large shrub, long purplish petals, large flowers, fragrant leaves. Notes: Sweet-shrub (Strawberry-shrub) family. The genus is from the Greek "calyx" flower, meaning ‘hollow receptacle.’ Deciduous or evergreen, aromatic shrubs. Can grow into small trees. This is a favorite of ladybugs, which may spend the winter packed into the urn-shaped seed pods or, at lower elevations, massed on top of one another in large clumps to stay warm. A good specimen is found at the first bridge of the handicap (left) trail. Prefers moist, shady places. 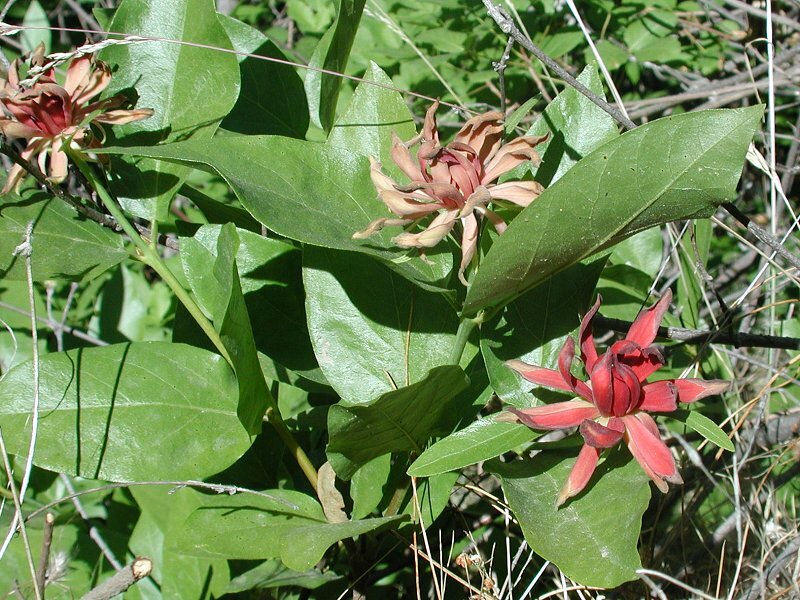 Also called Sweet Shrub. Species Calycanthus occidentalis Hook. & Arn.